Why (Not) A Latin Wild Things? When Maurice Sendak's Where the Wild Things Are was first published in 1963, it became a classic almost overnight, selling more than 20 million copies to date and inspiring the creation of a host of offspring, including children's toys, dolls, and puppets, board and video games, a 1980s children's opera, coscripted by Sendak himself, as well as other musical compositions, and the much praised 2009 feature film adaptation, directed by Spike Jonze. The book has earned countless recognitions, including the 1964 Randolph Caldecott Medal for "the most distinguished American picture book for children," and in 2015, a half century later, was ranked first in TIME magazine's list of the "100 Best Children's Books of All Time" (though truly the book's appeal extends all the way to us senior citizens!). It has been translated into numerous other languages, including French, German, Spanish, Hebrew, and even Finnish, but never until now into classical Latin. Click on the "Digital Content" tab to access resources provided by Richard A. LaFleur, a.k.a. Doctor Illa Flora, for his Latin translation of Where the Wild Things Are. Richard A. LaFleur, a.k.a. Doctor Illa Flora reading Ubi Fera Sunt at a recent book-signing, BOOKS AND BEANS in Little Switzerland NC. Richard LaFleur's translation at once retains the lively spirit of Sendak's classic and demonstrates just how lively the Latin language itself can be. There is nothing "dead" about this translation! I have found this book very useful in introducing the Latin language to my children. I first read to them Sendak's original, and then follow that up with LaFleur's translation. As I read the Latin version to them, I point out the many English root words. The goal is not to raise little Latin speakers, but to help them understand just how important Latin is to their native language. This book is a tremendous help in that project! The past twenty years have been a veritable “Golden Age” for Latin translations of children’s literature, from some of Dr. Seuss’s best-known titles1 to the first two books in the Harry Potter series,2 and even The Diary of a Wimpy Kid,3 as well as many others. The latest to join these ranks is Ubi Fera Sunt, a delightful translation of Maurice Sendak’s beloved children’s classic by Rick LaFleur, himself a classic, best known for his thorough updating of Wheelock’s Latin. et volvebant oculos terribiles terribilesque ungues monstrabant. The result is a text that sounds as amusing and engaging in Latin as Sendak’s original does in English. Even my non-Latin-speaking eleven-month-old found it funny! Some readers may be dismayed to find no translation aids whatsoever in the text. The book looks exactly the same as the original version, except that the text is, of course, in Latin. This was the requirement stipulated by the copyright-holders, that with the exception of translating the text, the book was not to be altered in any way. Still, resources — including a vocabulary list, an audio recording of the Latin text, and a variety of quizzes for classroom use — are all provided free of charge on the Bolchazy-Carducci website. 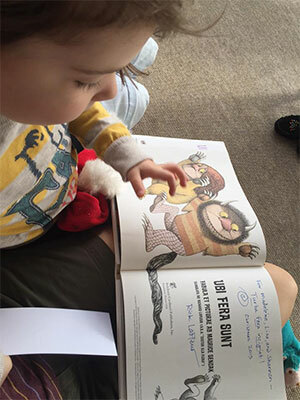 Although Ubi Fera Sunt is more expensive than the average children’s book, it is not significantly pricier than the English-language original. Thus this book could be suitable as a fun extra text for middle-school or high-school Latin classes, as well as for family libraries, and as “chicken soup” for the tired Classicist’s soul. 1Dr. Seuss (author), Jennifer Morrish Tunberg and Terence Tunberg (trans.). Quomodo Invidiosulus Nomine Grinchus Christi Natalem Abrogaverit: How the Grinch Stole Christmas in Latin. Mundelein, IL: Bolchazy-Carducci Publishers, Inc., 1997; and Cattus Petasatus: The Cat in the Hat in Latin. Mundelein, IL: Bolchazy-Carducci Publishers, Inc., 2000. 2J. K. Rowling (author), Peter Needham (trans.). Harrius Potter et Philosophi Lapis. New York, NY: Bloomsbury USA Children’s, 2003; and Harrius Potter et Camera Secretorum. New York, NY: Bloomsbury USA Children’s, 2006. 3Jeff Kinney (author), Daniel Gallagher (trans.). Diary of a Wimpy Kid Latin Edition: Commentarii de Inepto Puero. New York, NY: Harry N. Abrams, 2015. Richard La Fleur has published a Latin version of Maurice Sendak's Where the Wild Things Are, a picture book widely praised for its resonant narrative that stirs the emotions even after repeated readings. Latin students react with surprise and fascination to translations of well-known books, and this tale of Max, who defies his mother and takes a mysterious journey to rule over the Wild Things, is instantly recognizable to many. Shorter than books such as Cattus Petasatus (The Cat in the Hat), it can easily be read within one class period.1 It is an excellent starting point both for conversations in Latin and for discussions of the choices that translators make in reworking a story. A common source of frustration for students is that even a short children's book can contain many unfamiliar Larin words. While Ubi Fera Sunt is no exception, its compelling narrative carries readers forward, and Sendak's illustrations provide opportunities to expand on the text. If students need help with "Ea nocte Maximus vestem lupinam gerebat et faciebat malum unius modi et alterius," the teacher can use Latin to point out the picture of Max in his wolf suit and ask what bad things he is doing. Advanced students will follow the story and appreciate the playfulness in the Latin, such as the sounds of "Fera fremebant fremitus terribiles et frendebant terribiles dentes" ("The wild things roared their terrible roars and gnashed their terrible teeth"2). With less-experienced students, teachers will need to provide a bridge to LaFleur's text by retelling the story in simpler Latin and supplying unknown vocabulary. Ubi Fera Sunt offers readers many useful expressions both old ("Amabo te") and new ("Turba fera incipiat!" for "Let the wild rumpus start!"). The Latin provides subtle lessons in usage, such as the distinction between "eating" and "eating up": Max tells his mother "COMEDAM TE!" (''I'll eat you up! "), whereupon "missus est, igitur, ad lectum sine edendo quidquam" ("so he was sent to bed without eating anything''). A few points pose special difficulties. In my high school classes, the "missus est" sentence confused students who associated lectus with reclining at dinner as well as with sleeping. At the story's emotional turning point, Max gives up dominion over the wild things to return home because "bona quae esset olfecit." Even strong readers had trouble making out the meaning "he smelled good things to eat," especially since the verb is easily confused with "to be." Here is an opportunity to prepare students by giving them some extra examples of the "to eat" esse, and perhaps to point out the very different constructions that can be required in Latin and English. The book is printed on substantial, creamy paper, and Sendak's illustrations are as sharp as hand-colored engravings. These details make the book pleasurable to examine and easy to see in a group setting like a classroom. Useful ancillary materials are provided on the Bolchazy-Carducci website3. Of special note are a short essay "About the Translation ," which goes a long way toward gratifying readers who are curious about the translator's choices, and a delightful recording of Dr. LaFleur reading the book aloud. Brief yet evocative, Ubi Fera Sunt will enchant those who know the English version and provide much pleasure to new readers. 1See the 75-page Latin translation of this Dr. Seuss favorite by J. Tunberg and T. Tunberg. Bolchazy-Carducci Publishers (2000). 2The English given here is from Sendak's original text. 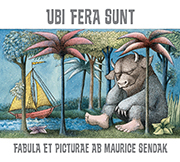 Ubi Fera Sunt is the first ever Latin rendition of Maurice Sendak's classic children's picurebook, Where the Wild Things Are. Skillfully translated by Richard A. LaFleur, Ubi Fera Sunt is a new way to enjoy this long-beloved favorite, and features the remastered artwork of the fiftieth anniversary edition. Ubi Fera Sunt is especially recommended as a delightful enhancement to introductory Latin classrooms! Follow along as Doctor Illa Flora reads Ubi Fera Sunt! And watch Illa Flora's reading at a book-signing at the Books and Beans bookstore in Little Switzerland, NC. Ubi Fera Sunt, with its limited vocabulary, makes a great addition to Latin classrooms of any level. To help make it an effective classroom resource, we have provided links to several quizzes on Quia and Kahoot that will make it fun and easy for students to master the vocabulary. Instructions on how to use Quia and Kahoot are below. For teachers who don’t use these programs, the complete vocabulary list, divided by part of speech, is also available as a Word document.